Neomycin antibiotic ointment helps fight infection in minor cuts, scrapes, and burns. Packaged in a 0.9 gm. unit dose packet for individual application without cross-contamination. Available in convenient 25-pack dispensing carton. 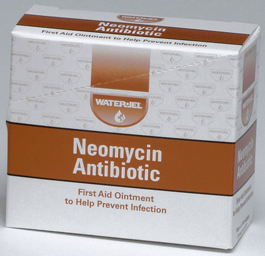 Ideal for medical cabinets or first aid kits.